We build and repair custom canvas products for your boat, home, or business. Traditional canvas products were made of flax in the very early days, then cotton, which is still available today. Now most of these types of products are made from acrylic, polyester, and other blended materials. Let us help you find the best exterior fabric suited for your application and price point. In addition to repairs of all types we specialize in sail covers, boat covers, and equipment covers for use outdoors and in the marine environment. Style and fit are a priority but it is equally important to choose the correct fabric and design for an attractive and robust product with a long lifespan. Sail Covers should provide UV protection from the Sun and water resistance from the rain and snow, with breathability to prevent mold and mildew, and a good fit so they won't flog in the wind. An array of fabrics to choose from include: Sunbrella, Acrylite, Odyssey, UV Dacron, Weathermax, etc. Boat Tops should provide strength and protection from the Sun, wind, rain and snow and have some aspects of breathability too when enclosed. Some fabric choices include Weathermax, Seamark, Sunbrella, Stamoid, and Vinyl products. 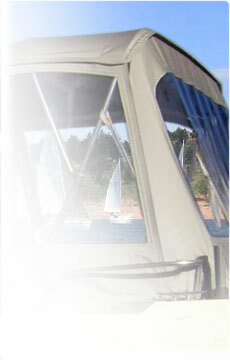 Boat Travel Covers will provide strength and abration resistance in addition to the other elements of protection. Fabrics include solution-dyed polyesters such as Top Gun, Topyssey, Top Notch, and Odyssey. Boat Mooring Covers and Winter Covers - On or off the trailer, mast up or down, these covers should emphasize UV protection, water resistance, and breathability and may include a structure of battens or a framework to support the weight of snow, falling leaves, etc. Sail Shades are designed to be strong, while creative, structures designed to provide Sun, wind, and moisture protection to your outdoor gathering areas such as patio, deck, porch, etc. typically using posts or existing structures for their support. Red Sky by morning, sailor take warning.